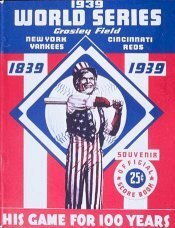 The 1939 World Series featured the three-time defending champion New York Yankees against the Cincinnati Reds, who were making their first Series appearance since the scandal-tainted 1919 World Series. The Yankees swept the Series in four games for the second time in a row, winning their record fourth consecutive title (they would later win five straight from 1949–1953). Yankee manager Joe McCarthy won his fifth title, tying the record held by Connie Mack. 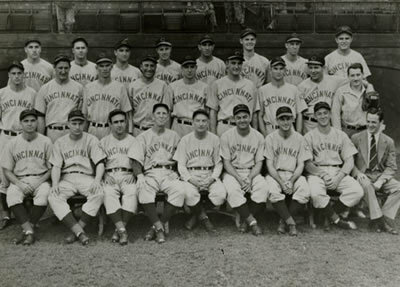 The Reds had made it to the Series despite finishing last in the National League in 1937 (56–98, .364) and then fourth in 1938 (82–68, .547). In the tenth inning of the final game, a famous play at the plate typified the Series. Charlie Keller scored when he and the ball both collided with catcher Ernie Lombardi and then Joe DiMaggio also scored while Lombardi, rolling on the ground, tried in vain to retrieve the ball. Lombardi had been smacked in the groin, but the puritanical press reported it as if Lombardi was "napping" at the plate. The Yankees matched the Reds in hits with twenty-seven but out-homered the Reds seven (7) to none (0). Charlie "King Kong" Keller led the Yanks with eight runs, seven hits, three home runs, six runs batted in, a .438 batting average, and a 1.188 slugging percentage. Keller broke the record for most homers by a rookie in a World Series game, during Game 3 when he went deep twice. Also in Game 3, Junior Thompson gave up five (5) hits in 4.2 innings worked. Four (4) of those five (5) hits were home runs tying the record for long balls allowed during a Series game set by Charlie Root during the 1932 World Series. The Cincinnati Reds returned to the big show for the first time since 1919 when they were the beneficiaries of the famous "Black Sox Scandal" in which their opponents, the Chicago White Sox, intentionally threw the Series. After a lengthy investigation in 1920, the members of Chicago's team were amazingly acquitted the following year despite their own confessions (which were recanted later). Many Reds fans later realized that their "championship title" had been tainted and were anxious to see their team win one on their own terms. Their sudden rise to the top of the National League was more than impressive (after finishing at the bottom of the National League in 1937) and their "Cinderella season" featured the two winningest pitchers in all of baseball. Bucky Walters led the major-leagues with twenty-seven wins and Paul Derringer backed him up with twenty-five of his own. For their opponents, the perennial championship Yankees, it was business as usual. New York finished the regular season with a 106-45 record and won their fourth consecutive pennant by seventeen games. Reds manager, Bill McKechnie, went with Derringer for Game 1 and Joe McCarthy selected Series regular, Red Ruffing. The Yankee veteran played true to form with an opening four-hit, 2-1 victory that featured a last-inning, tie-breaker on a Bill Dickey single. Cincinnati was down, but not out as they had shown that they could stand tall against the 3x defending champions. Unfortunately for Reds fans, nothing changed the following day as Monte Pearson beat out Walters with a two-hit, 4-0 masterpiece that put his team up two games-to-none. Babe Dahlgren (who had replaced Lou Gehrig for the Yankees) doubled and homered in support. The first-baseman had taken over May 2 when failing health and an accompanying decline in skills had forced the "Iron Horse" out of the New York lineup after 2,130 consecutive games. Not since 1923 had the Yankees engaged in postseason play without Gehrig and fans and players alike dearly missed his presence. For Game 3, the Reds came out swinging and finally generated some offense against the Yankees pitching staff while out-hitting the Bronx Bombers by more than a 2-to-1 margin. However, as in most sports, "quality" mattered more than "quantity" as all ten of Cincinnati's hits resulted in mere singles. New York, on the other hand, got two-run homers from rookie Charlie Keller in the first and fifth innings, a two-run blast from Joe DiMaggio (who batted a career-high .381 in the regular season) in the third and a bases-empty shot from Bill Dickey in the fifth. The final was a 7-3 romp that put the Yanks one game away from their fourth consecutive championship. Game 4 was a tense 0-0 standoff until the seventh, when Charlie Keller and Bill Dickey both launched bases-empty homers off of the returning Derringer. The Reds quickly answered back in their half of the inning for three unearned runs off reliever Steve Sundra, who had replaced ailing starter Oral Hildebrand in the fifth. Johnny Murphy tacked on an "insurance" run in the eighth, but shortstop Billy Myers' error on Dickey's potential double-play ball in the ninth enabled the Yankees to move within one. Then, New York scored again when DiMaggio beat a throw to the plate on Joe Gordon's grounder for the 4-4 tie. With runners on the corners and one out in the tenth, "Joe D" came up big again and singled to right for the game winner. That would have been trouble enough for Cincinnati, but rightfielder Ival Goodman misplayed the ball and another run headed home. That, too, would have been trouble enough for Cincinnati, but catcher Ernie Lombardi not only failed to hold Goodman's throw to the plate, but he also was knocked down by the onrushing Keller and the ball rolled away. As a result, DiMaggio was able to circle the bases untouched, as the Reds' receiver lay stunned. "Schnozz's snooze" the play was called, and it won a special place in baseball folklore despite its minimal impact overall. In the bottom of the tenth, Cincinnati managed to send the tying run to the plate three times, but were unable to finish the job as Johnny Murphy protected the Yankees' 7-4 lead for their second consecutive sweep, and fourth consecutive World Series title. Keller, the Series star, led the contest in runs scored (eight), hits (seven), home runs (three), runs batted in (six) and batting average (.438). In the end, the Yankees had won thirteen of their last fourteen Series games and twenty-eight of their last thirty-one games in baseball's premier event.